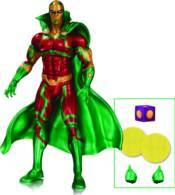 Now you can collect action figures of your favorite DC Comics characters from any era in an all-new 6' scale. This first assortment features Batman, Deadman, Green Arrow and Mister Miracle. Each figure comes with multiple accessories! 1. BATMAN: LAST RIGHTS - 6" 2. DEADMAN: BRIGHTEST DAY - 6" 3. GREEN ARROW: THE LONGBOW HUNTERS - 6" 4. MISTER MIRACLE: EARTH 2 - 6" EACH FIGURE SOLD SEPARATELY RETAILERS: DC Collectibles will be continuing to number action figure lines to increase collectibility. These numbers will be shown before the character name moving forward.